I learn so much each time I'm at the HerbFarm that I wish I had one of those official "Press" recorders or at the very least, a note pad. It's not like the note pad is that far off, it's just that likely when I am catching some great bit of information I have some soil-encrusted purple gardening gloves on my hands or I am too busy absorbing the information and asking questions that I don't have time to write it all down. Thankfully, I remember to bring my little digital camera with me and capture the moments that are reminders to write about later. 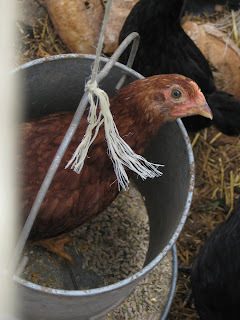 And of course the chickens keep growing and causing mischief, like this one chicken who has found her way inside the feeder and she doesn't look one bit guilty to me.